See press release and photos here. More than 70 people demonstrated outside the G4S Annual General Meeting this afternoon to protest against the company’s horrendous human rights record in various ‘markets’, from Israeli prisons and UK immigration detention centres to destroying public services. Campaigners met shareholders at the entrance and handed them an alternative annual report that looked like a real G4S publication, but criticised the conduct of the private security company in its dealings with the UK and Israeli governments. The company lost its contract to deport refused migrants from the UK last September after 773 complaints of abuse were made against the company and following the death of Jimmy Mubenga, an Angolan asylum seeker who died after being ‘restrained’ by G4S guards. Despite this, G4S has recently been awarded contracts to provide housing for asylum seekers, organise security for the Olympic games and run huge parts of the Lincolnshire police force. The company also runs six prisons where 400 prisoners are hired for 40 hours a week for as little as £2 a day. G4S looks set to be awarded further immigration, policing and prison contracts and to take on a greater role in the NHS. ‘G4S has manoeuvred itself into a pole position to profit from the coalition government’s plans to destroy public services through slashing workers’ pay and sacrificing the quality of services, as well as by hiring establishment figures like former Metropolitan Police Commissioner Lord Paul Condon as board members. Poorer services, less accountability, more profits.’ said Shiar Youssef of Corporate Watch, a research organisation which recently published a comprehensive profile detailing the company’s activities and alleged crimes. G4S also provides equipment to Israeli prisons in which Palestinian political prisoners, including child prisoners, are illegally held and tortured. More than 1,600 Palestinian political prisoners recently held a mass hunger strike and several remain on hunger strike. Palestinian organisation Addameer last night warned that the three Palestinian prisoners who have been on hunger strike for 81 days face an ‘imminent threats to their lives’. ‘Israel systematically denies Palestinian political prisoners their basic rights, including the right to a fair trial and to protection from arbitrary detention and torture. How can the UK government give lucrative public contracts to a company that has chosen to facilitate the denial of such basic rights?’ asked Diana Neslen of Jews for Justice for Palestinians. Israel is forbidden to transfer Palestinian prisoners from occupied territories to prisons inside Israel by Article 76 of the Fourth Geneva Convention. Despite this, thousands of Palestinian prisoners are unlawfully held in prisons inside Israel that are supplied by G4S. G4S also provides equipment and services to Israeli settlements, checkpoints and the illegal Apartheid Wall. The protest was supported by Palestine Place, a newly reclaimed space in central London hosting two weeks of workshops and discussions in support of Palestine. 1. The action was supported by the Boycott Israel Network, Corporate Watch, Croydon Migrant Solidarity, Defend the Right to Protest, Friends of al-Aqsa, International Federation of Iraqi Refugees, Jews for Boycotting Israeli Goods, Jews for Justice for Palestinians, National Coalition of Anti-Deportation Campaigns, No Borders London, No One is Illegal, Palestine Place, Palestine Solidarity Campaign, South Yorkshire Migration and Asylum Action Group, Stop Deportation Network, War on Want, Yorkshire Region Plus No to G4S Campaign. The Traveller Solidarity Network, is touring the country throughout the month of March to build links between local settled people and Traveller sites. A short film of interviews which discusses current Gypsy and Traveller struggles will be shown. The talks aim to develop an understanding of different forms of oppression that Gypsy, Roma and Traveller communities experience, in areas such as day to day discrimination, housing law, land rights and evictions. new network resisting the oppression of Travellers, and strategies for local support for GRT communities facing eviction and prejudice in the area. We hope to include voices from a range of established GRT organisations, and groups currently engaged in a wide range of related struggles, and we are keen to collaborate with local groups in organising these meetings. The Institute of Race Relations today reproduced a letter signed by academics in the Yorkshire region expressing concerns over the awarding of a housing contract to a private company. More information is also online in this campaign briefing by South Yorkshire Migration and Asylum Action Group. Late last year, G4S were announced as the preferred bidders for the contract for housing in the north east for people seeking sanctuary. The formal contract is due to be awarded in February. People arriving in the UK in search of sanctuary were once able to access welfare benefits and council housing on the basis of need, like people already living in the UK, but a series of harsh legislation brought in from 1996 onwards withdrew this, and, after attempts by the government to leave all new arrivals destitute were ruled unlawful, created a separate system for support for people seeking sanctuary. These changes, setting up a parallel system, can be seen as a divide-and-rule tactic, segregating people seeking sanctuary from other council house tenants and welfare claimants. ‘Lucrative contracts to house asylum seekers were frequently taken up by local authorities, sub-contracted to accommodation providers and then sub-contracted further to private landlords. The result was a housing system which in many instances was poorly regulated, substandard and unsafe’. In the North East, one of the private companies providing housing was Angel Group, investigated for ‘financial irregularities’ , and the subject of many protests. Private sector involvement has now increased, with local authority contracts being dropped in favour of contracts with 3 multinationals – Serco, Reliance and G4S – who have contracts between them covering the whole of the UK. G4S, who are set to get the contract for the north east, are the world’s largest security company and have contracts to transport, detain and imprison throughout the world. Going under the company slogan ‘Securing Your World’, G4S have contracts for several immigration prisons and short-term holding facilities in the UK. An unannounced visit to one of these by HM Chief Inspector of Prisons last year found numerous problems, and campaigners have highlighted the poor treatment people held there face. A Freedom of Information Request showed 773 complaints from people held in these centres in 2010. G4S recently got a contract to run Birmingham prison, the first public prison in the UK to be transferred to the private sector, and hold contracts for other private prisons, as well as Secure Training Centres and Youth Offender Institutes where children and young people are held. Child prisons such as these were described in a recent ruling by the courts as places where unlawful use of force against large numbers of children was widespread. G4S are involved in court security, prisoner transport and electronic tagging, and have the contract for security at the Olympic Games in London. 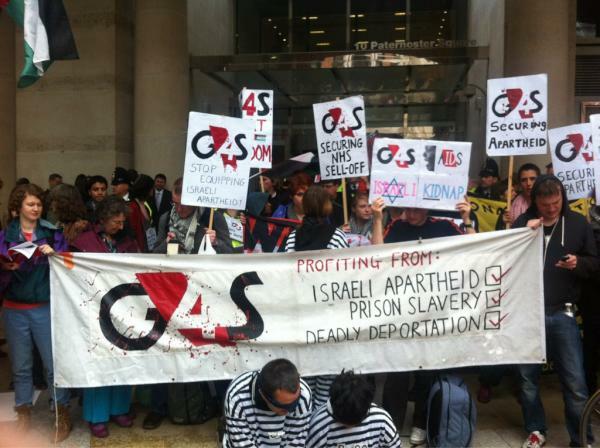 G4S have received criticism recently for their involvement in the border security industry in Palestine. Globally, G4S are huge profiteers of the Prison Industrial Complex . In 2010 G4S were accused of killing Jimmy Mubenga, who died after being restrained by G4S security guards during a forcible deportation to Angola. Three G4S guards were arrested and are still under investigation. In response, protests and vigils against G4S have been held, including at the company’s AGM last year. In July 2011, Amnesty International called for a complete overhaul of enforced removals by private security companies, after researching and documenting allegations of excessive force and other abuse carried out by private security staff, including G4S, while in January 2012, a Home Affairs Select Committee report investigating the death of Jimmy Mubenga criticised the “cosy relationship” between UKBA and its private contractors. Statewatch also reported on the ‘privatised manslaughter’. In Australia, G4S pleaded guilty in 2011 after a man died of heat-stroke whilst being transported by G4S staff in the back of an un-airconditioned van in 40 degree heat . This and many more of the horrors of G4S were highlighted by protesters in Tucson, Arizona, who took action last year to expose the G4s’ profiteering from misery and suffering, saying ‘G4S not only reaps the profits of border enforcement, they also shape public policy to criminalize immigrants and ensure a steady stream of people to fill their buses and jails’. In ‘Security and immigration: Toward a critique of the governmentality of unease’ Didier Bigo discusses the way the idea of ‘security’ has been transformed in ways which meet the interests of security professionals, expanding their sphere of influence. In the UK, research has shown that G4S pays £45,000 a year to former defence secretary John Reid MP (now Lord Reid) for ‘strategic advice’, and got contracts with government departments whilst Reid was still in office. G4S recently got a contract for the much criticised ‘workfare’ programme – forced unpaid labour for people in receipt of benefits. In taking over this contract, G4S have also been accused of trampling on workers’ rights, not uncommon for G4S, who were investigated in 2006 for breaching labour rights in several countries. A report by UNI Property Services and Alliance for Justice at Group 4 Securicor in 2007, highlighted frequent violations of labour laws by G4S in Malawi, Mozambique and South Africa and brought attention to the racism, poverty wages, and oppression faced by people employed by G4S in those countries. Whilst in the UK, changes to the welfare system and changes to the asylum support system are pushing people further and further into poverty, companies like G4S are raking in profits from contracts. Nick Buckles, chief executive of G4S, took home £3.8 million last year, whilst slashing of the housing budget for asylum seekers, pensions, welfare, and public services began. The example of G4S illustrates the practices that are part and parcel of the current economic system, a system based on ‘securing the world’ for the privileged few – increasing their power, privilege and wealth at the expense of the many. Resist profiteering, segregation, exploitation and oppression! Anti-cuts protestors, anti-capitalists, welfare claimants, people migrating, prison resistors, workers’ rights activists, trade unionists, everyone! Campaign Briefing by South Yorkshire Migration and Asylum Action Group. Actions included some of the group travelling to Dale Farm, a site home to travellers who were threatened with eviction. Residents and visitors worked hard to resist eviction together, including building barricades, securing people’s homes and mounting challenges in the law courts. The Traveller Solidarity Network, a network of Travelling and settled people, working together to promote and effect equality, challenge discrimination and work against evictions has emerged from the resistance. Some people from No Borders NE went to the No Borders camp in Bulgaria, spending a week in an area key to the expansion of the EU border regime. Discussions, film showings and protests were arranged in towns and villages locally and in nearby sites in Greece which raised awareness and provided information about detention centres, border controls, economic migration and what people can do. One outcome of the camp was to show people who lived in the region and are affected by border controls, that there was transnational support for freedom of movement. In November people joined protests against dawn raids snatching people from their homes in Glasgow. The protest stopped any vans going out that day, keeping the gates shut for a marathon 10 hours! In December No Borders NE held a protest against deportations, at North Shields UKBA reporting centre, supported by Tyneside Community Action Against Racism and others. Films Without Borders Film Festival at the Star and Shadow Cinema, Newcastle, with local invited speakers, helped build links with other groups. Issues covered in the film series included journeys, destitution, living conditions and resistance. The group ran a busy workshop at the Free Hetherington Glasgow University Student Occupation, linking border control regimes to an unequal economic system, exploitation and creation of cheap labour markets and reinforcing privilege. 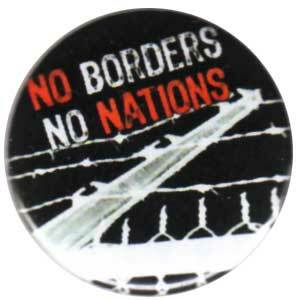 The workshop was also run by No Borders NE in a series of seminars as part of a module at Newcastle University. Some people were invited to contribute to a handbook for ‘radical teenagers’ and created a graphic novel zine, showing individuals journeys being compared and linked in terms of nationality and privilege. People involved in No Borders North East also went to Beyond Borders Day School in Bristol, Bridget Anderson (Justice For Domestic Migrant Workers, Oxford University), spoke on “Why No Borders?”, Clara Osagiede (RMT Cleaners Rep, Living Wage Campaign) spoke on “Migrant Worker Struggle” and Ann Singleton (Statewatch) discussed “The Changing Meaning of Borders in the EU”. Newcastle Conversation Group continued to be lively and busy every week offering friendship and mutual aid, as well as putting on events, fundraising, supporting the campaign against ESOL cuts and more. Onward to solidarity and resistance in 2012! The National Coalition of Anti-Deportation Campaigns is a UK organisation which supports community-led campaigns for justice in the asylum and immigration system, with a focus on supporting people facing forced removal. Their news service gives up to date information on immigration and asylum issues. Last week saw protests against a UK charter flight to Sri Lanka, in which activists struck at the heart of the Government’s “unjust deportation machine”, and blocked the road outside Colnbrook and Harmondsworth immigration prisons with ‘lock-on’ devices and a tripod. Today, Monday 19 Dec, the UK Border Agency are carrying out a mass deportation of Afghan asylum seekers to Kabul. In response to this there will be a protest at 12 noon outside of the UKBA Reporting Centre in North Shields, Tyne & Wear. Charter flights are a numbers driven exercise to remove as many people as possible. They are conducted under a veil of secrecy which denies deportees access to justice. With the secrecy surrounding charter flights it is impossible to know how many other deportees on this, and other flights have been similarly denied access to justice and equality. The UK asylum determination system is structured towards denying as many applications as possible. Because of this, people who are in need of sanctuary are refused status, made destitute and subjected to violent enforcement procedures. Charter flights such as this one and forced removals in general must be stopped. Yet the UK Border Agency ignore these reports in favour of out of date country evidence which supports their claim that Afghanistan is a safe place. Forced removals such as this are an illustration of the violence and indifference that are essential components of the UK’s dehumanising migration regime. The vast majority of deportations have been to countries devastated by wars and armed conflicts such as Afghanistan, Iraq, DR Congo, Nigeria, Jamaica, Sri Lanka. After being forcibly deported, many have been kidnapped, imprisoned, tortured and killed. Others have had to change their identities or move again to avoid persecution. Forcible deportations tear apart people’s lives as they are split from their families and communities and their right to freedom of movement is denied. Stop Deportations! Freedom of Movement for all! On Monday 19th September, after a stressful day of waiting for the 1st attempt by baliffs to enter Dale Farm travellers site – which certainly would have been repelled – residents and their supporters could relax for a couple of days thanks to a rare positive intervention on the part of the travellers from a high court judge… Read more in Dale Farm Lives On ! a report by Bristol No Borders. The latest news is that the Dale Farm case is back in the courts on Friday 23 Sept, see below for the call-out for ongoing support. Dale Farm eviction postponed (but not cancelled)…. Although Dale Farm residents won an injunction in the High Court, this only postpones the eviction until Friday. At 11.30am the court will consider the technical legality of the notices which the council issued. Depending on the outcome of this hearing, the eviction may be reactivated immediately on Friday afternoon. We’re here in solidarity with the residents for as long as they want us to support them. The residents have made it clear to us that, should the eviction be reinstated, they want our strong and continued support to resist it. This means we need to be prepared to show a very strong presence on Friday should the hearing permit the council to restart eviction proceedings. Supporters will need to be on alert and ready to come down to the site immediately on Friday, given a negative outcome. Come to the High Court on the Strand to show your solidarity with the Dale Farm residents at 11.30 on Friday or come to the site. Visit http://dalefarm.wordpress.com/contact for info on how to get here. Solidarity is needed at Dale Farm, Essex, with ongoing activities against the upcoming forced eviction of 90 families. Basildon Council has said the eviction is planned to take place week beginning 19th September 2011, when electricity supplies will also be cut. 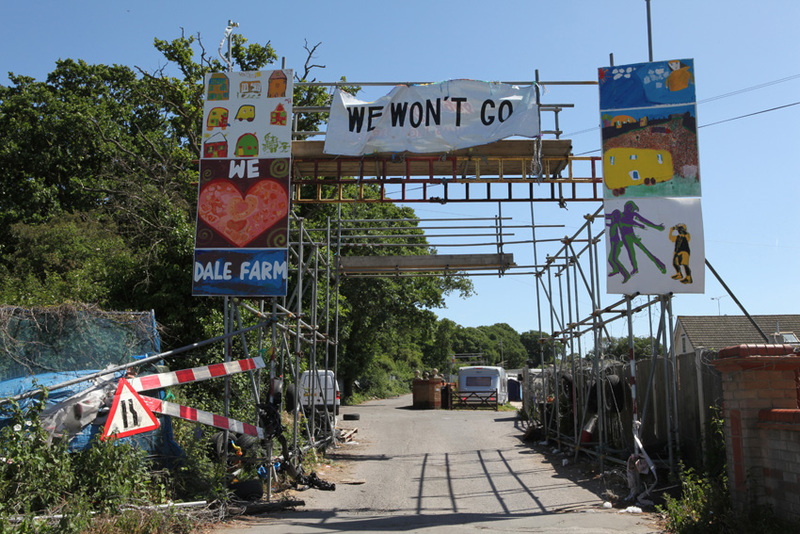 The council has threatened to close roads around Dale Farm in advance of the eviction, so it is recommended that people come as many days before the eviction as possible. Also, there is plenty of work needed to prepare in advance. Sleeping space in homes are available, but please bring a tent if you can as bed space limited to those in need. People are welcome at Dale Farm any time. See http://dalefarm.wordpress.com/activity for details.